Well, I gotta do the side of the road, too, otherwise this is going to be weird. If I'm doing the side, might as well fix up that corner at the tunnel mouth. If I'm fixing up the tunnel mouth, I really should paint the embankment. If the embankment has wet color, might as well put a base layer of flock down. If I put flock on one side of the road, might as well put it on the other side, too. The other side should be a small meadow, since the Emsingen operator will destroy anything delicate there sooner or later anyways. Static grass would be nice. If I work on the area below the Steinle rockwall, I should really install that drainage culvert. Ooooh, working with spackle paste is nice! If I install the culvert portal on one side, I should install the other side, too. Hey, that static grass looks great. Need some on the other side of the tracks below the rock wall, too. That rock wall is so awfully gray, I wonder if I could put some scenery glue on the ledges and plant weeds. Oh yeah, that's good. Scenery glue is a a bit too runny for just the ledges, though... That's ok, let's do the other half of the rock wall, too. I really should install the tunnel portal below Emsingen, as well as the bridge by the waterfall. Oh, and the top of Steinle should finally get grass, too. The rock wall needs more weeds and small bushes. It should be more overgrown. Ooops, it's late. I should really stop now. Yes, I'm now in full blown scenery mode, and most of the progress is not even visible in the photo. 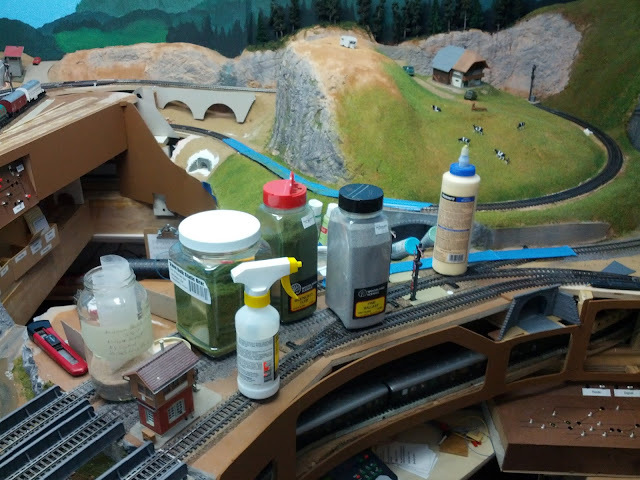 Now that I completed a major electrical piece of the layout, the plan is to attack the area between Talheim station, Steinlehof, and the card board cut outs in the back over the coming weeks. Ich bewundere Dich: wie Du so ganz locker darlegen kannst, wie eins ins andere greift, das es mehr Sinn macht die linke und die rechte Seite herzurichten, wenn man sowieso schon den Pinsel angesetzt hat; wäre doch blöd, wenn man in der Region dieselben Arbeiten noch einmal von vorne beginnt, nur weil sie anfangs nicht vorgesehen waren, fantastisch mit welcher gleichmäßigen Ruhe Du diese Erkenntnisse umsetzt und nicht genug mit dem Erkennen, auch noch ausführst. Sagte ich schon - ich bewundere Dich? wenn nicht dann sage ich es jetzt!